The Bisti Badlands just outside of Farmington, New Mexico are quite the site to see. The sparse wilderness area is a rolling landscape with some pretty unusual things to see. In fact, some say that it is the most unusual scenery found in all of the Four Corners Region. Weathered rock formations made of shale, sandstone, coal, silt and mudstone make up the Bisti Badlands. The rock formations shaped like pinnacles known as hodoos, are also known for its fossils left behind from millions of years ago. About 60 square miles, the Bisti Badlands were once a coastal swamp of an inland sea. The area was home to dinosaurs, primitive mammals, reptiles, and large trees. The current landscape of the amazing rock formations is a pretty good preservation of the ancient life forms from the swamp. Now a desert, you may already know that the badlands wilderness area is a great place for hiking. You can explore the wilderness area and get up close and personal with the unique rock formations. There’s a good chance you will be stunned by this natural wonder. 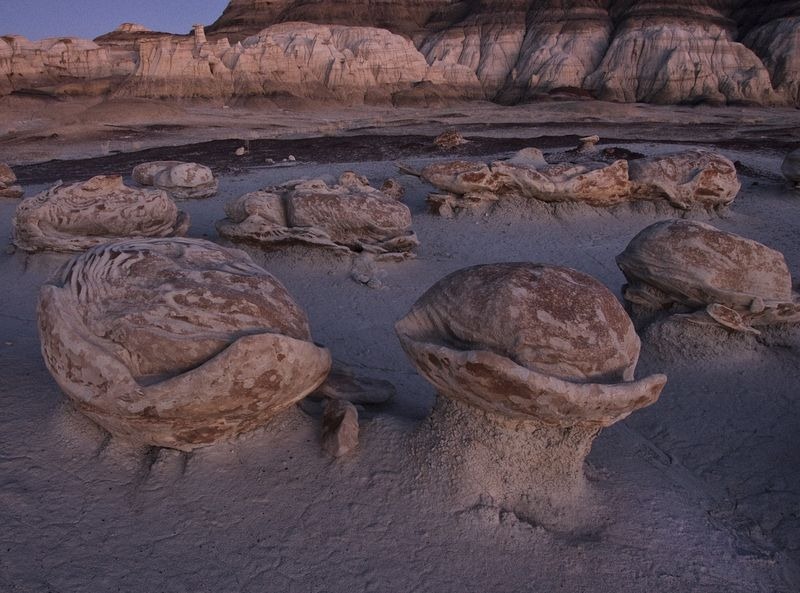 But if you have visited Farmington before, maybe you have already seen the Bisti Badlands. But have you seen them at night? The Farmington Museum offers a couple of guided full moon hiking trips each year at the badlands. And the next trip is coming up soon. Perfect for hiking enthusiasts and outdoor lovers, the next scheduled hike is October 15. From 6:30 pm to 10:00 pm, you will explore the badlands and experience the hodoos in a completely different perspective. Registration is required for the moonlight hike and space is limited. For just $5 per person, you will have round-trip transportation from the Farmington Museum & Visitor Center to the Bisti/De Na-Zin Wilderness making your guided full moon hike an even better experience. Even though the moon is full and bright, you will want to bring along a flashlight or headlamp to help illuminate your path. Dress warmly and in layers because when the sun goes down, the desert can get quite cool. Register for your nighttime full moon hike adventure into the Bisti Badlands here.